We are so proud to invite you to discover 2 artists Khin Zaw Latt and Emmanuel Flipo from 16 July to 16 August 2017. VERNISSAGE july 16, 2017 at 6pm with Music, tasting wine and some oysters. Free entrance. His paintings highlight the movement in the “moving forward” series, the movement of a group that advances in the same direction, which one perceives from the back, and one of whose members has the face turned and looks at us . The colors also participate in this ambience of uniqueness and singularity according to well chosen hues. The street people series is even more direct. The characters seized on the street are facing you, painted in gray tones with the still one color that marks the difference. 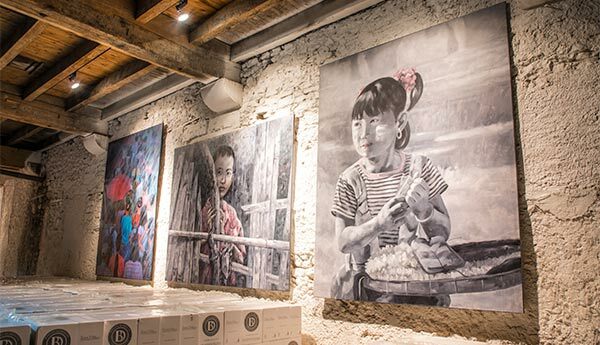 Artist now installed in Pézenas, Flipo realizes immense canvas perfect to adorn the ocher walls of our cellar. He knew how to crunch his Arne style and his wife as well as all members of the team. 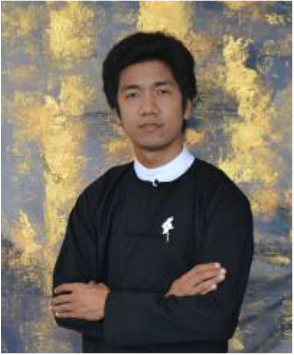 Khin Zaw Latt was born in 1980 in Laputta, Ayeyarwaddy Division, Myanmar. He grew up in a family of artists. Her father was a pianist, her dancing mother, one of her older brothers is a painter. He began to draw at an early age. He studied painting at the University of Culture in Yangon from 1998 to 2002. After graduating, he began a tour of Asia to increase his inspiration and artistic practice and traveled through India, Nepal, Malaysia where he performs an artist residency, Thailand, Singapore and Hong Kong. In 2008 he was awarded the Myanmar Contemporary Art Award, was a finalist in 2009 for the Sovereign Art Prize and won first prize in the first Myanmar national portrait competition in 2011. He presented his solo work in Thailand, Hong Kong , China, Singapore, where it is represented by Intersections Gallery, Nepal, USA and Canada, Germany and Belgium. 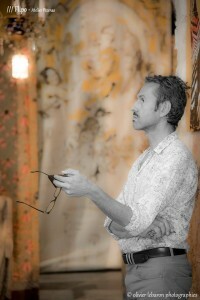 He opened a gallery in Yangon and created an art school, the Bamboo Art School. He is already recognized for three of his series: Budha, Moving Forward, Street People. Emmanuel Flipo graduated from the Ecole Supérieure des Beaux-Arts in Toulouse and the Ecole Nationale Supérieure d’Arts at Villa Arson in Nice. He was born in 1958 in Agen. He lives and works in Pézenas in France. Conceptual painter, inspired in his beginnings by the surface support movement and admirer of Joseph Beuys, he develops imaginary cartographies of an inner world that can take the form of collages, drawings, performances. His creations are fed by multiple trips as well as by a certain fascination of the accidental event. Using objects rich in accidents (old linoleums, worm-eaten wood, dried crusts of paint, vermin worn out …), he operates in situations that refer to the different scales of geography.